In Australia, approximately 150 vehicles are stolen every day. While there is no guaranteed way to prevent car theft, here are 5 simple rules you can use to reduce your risk of becoming a victim. Modern cars are generally a lot more complicated to steal than simply using a metal coat hanger and striking a couple of wires together. Most cars built post 1990 use a lot more digital software to get going and are generally fitted with an immobiliser. As such, getting a hold of the keys is generally the main mission of a modern thief. It is a great habit to never leave your keys in the car when it is unattended. Many cars have been stolen when the owner ducks into the shops, or even back into their own home, for just a minute. An unoccupied car with an engine running is not only illegal it is also very tempting for an opportunistic thief. You may not only be creating an opportunity for someone to steal your car, but you may also be at risk of invalidating your insurance. Car theft takes just seconds. Even if the engine is switched off take your keys with you and that applies even when your car is parked in your driveway or yard. When your keys are out of the car, avoid leaving them anywhere obvious, like an unattended handbag. Too often cars are stolen after the thief has broken into a home. To help avoid this, make sure your car keys are hidden away at night and that the spare key is in a secure location. Don’t leave your keys visible if someone peers through a window. Thieves will often break into a house for the sole purpose of stealing car keys. If the keys are left in plain sight on a table not far from the front door. If you must leave car keys in your house, hide them out of sight from windows or the front door. Most new cars have engine immobilisers and tilt sensors as part of the inbuilt security to prevent theft. This is the technology that makes it very difficult for a thief to break in and steal your car without the key which is why protecting your keys is so important. A GPS vehicle tracker can alert you if your vehicle is stolen and allow its location to be tracked in real-time. Many commercial vehicles implement GPS tracking but it can also be an optional extra available for private vehicle owners. Vehicle tracking devices are becoming more popular these days too, and can be activated when your car is stolen to aid police in quickly tracking its location. Ok, these are really only relevant for older cars that lack the sophisticated alarms of newer cars. Generally a lock won’t stop a determined thief, although it might deter them from attempting the break in, or slow them down a little bit if they do. Just because they can’t steal your car, doesn’t mean a criminal will not be willing to escape with other small wins. If you have to leave your valuables in the car, keep them out of sight to avoid tempting a passer-by from cracking the window and escaping with your goods. Keep your licence, or other ID cards in your wallet, not the glovebox. The owner’s handbook should also be stored elsewhere, as it may also contain security information, details about the car and personal details. Parking somewhere safe may seem like a pretty obvious tip, but even in the most affluent suburbs, your car can still be at risk. Thieves don’t like to be caught in the act. So park your car in an area that is well lit and in view of residents or the general public. Some car parks offer safety zones which are patrolled, so keep an eye out for those if parking in a carpark overnight. Try to park in a busy, well lit area. Make sure the car is locked. Although numbers of vehicle thefts have been on a gradual decline in recent years, we can all do our part to avoid being one of the victims. 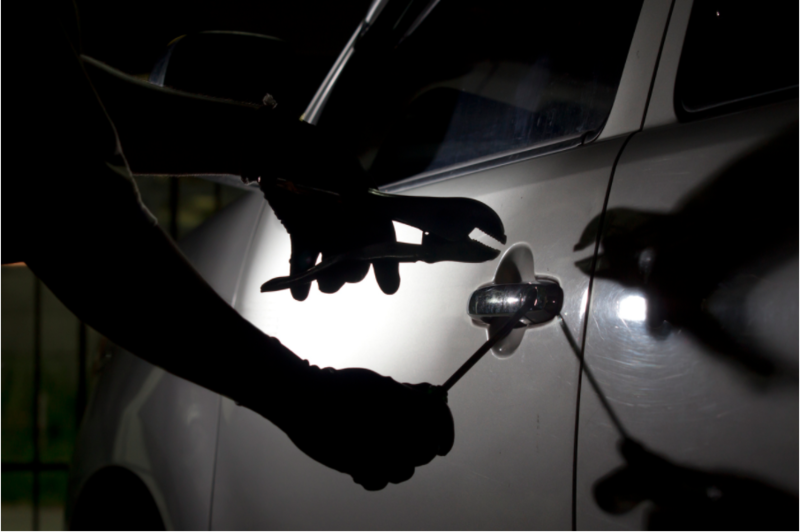 Following the simple rules outlined in this article will help you protect your car from theft. When it’s time to buy your next car, our brokers can advise you on the most suitable makes and models for your needs. We can also assist in arranging optional extras such as GPS tracking as part of your deal. For expert advice and assistance organising hassle free purchase, sale or trade-in, get in touch with us today. We look forward to assisting where we can.